It is with great sadness that I am writing to let you know that Carolyn Cohen passed away this morning. We will all remember her for her indomitable spirit and her scientific brilliance. We were active on a number of fronts in our laboratory at the Jimmy Fund during that time, but it eventually became clear, with Dr. Farber’s failing health, that we should seek to move the group, as a group, to another location. Of course, it was not easy then, just as it is not easy now, to secure three tenured appointments, including two for women, in any research university setting. After considering a few possibilities, we found that Brandeis University, in nearby Waltham, was building the Rosenstiel Basic Medical Sciences Research Center. Fortunately for us, Andrew Szent-Györgyi was on the faculty in the Department of Biology there, and Sidney Farber was a University Trustee. We officially took the name “Structural Biology Laboratory” and, in 1972, became the first research group at the Rosenstiel Center. Don joined the Physics Department; Susan, the Biochemistry Department; and I joined Biology. The memorial for Carolyn will be held March 23, 2018 at 2 pm in Berlin Chapel at Brandeis. Thereafter, a gathering will be held at the Faculty Club. Please contact aesposito@brandeis.edu for details. I was a shy Brandeis physics undergrad in 1971, and Rosenstiel was just a hole in the ground, when I was directed to seek out Cohen, Caspar, and Lowey at the Jimmy Fund for a possible part-time job. Involved thus only for a year, nevertheless the scientific direction of that early experience corresponded remarkably with the ultimate path of my research career. I am grateful for this undeniably formative interaction, so long ago. Years later, our shared interests led to several collaborations between myself and Carolyn, efforts from which I grew, and benefited, and accomplished work that I could never have done on my own. Again, I am grateful. However, what sticks with me even more is how much I was personally affected over the years by the extraordinary, difficult, Carolyn. I vividly remember being called in Iowa, for a referral about her chest pain, in Paris. But, no matter. In Carolyn, the personality and the intellect were so clearly wrapped up inseparably, creating a truly unique and extraordinary scientist, and a force, and a friend. I have two contributions to make. The first is a glimpse of Carolyn’s sense of humor. Carolyn was scheduled to give an undergraduate lecture that involved a discussion of hemophilia. She asked me, rather at the last minute, to make her a slide of Queen Victoria who was a victim of this disorder. This was before photos were available on the web, and my quickest access to such a portrait was the label of the Bombay gin bottle hiding in my cupboard. Carolyn LOVED this very unconventional representation of Victoria. Second is the quick example of how well Carolyn could size up people. In 1978 the lab was looking for a student assistant to help Paul Norton in the electron microscopy suite. Carolyn interviewed one applicant whom we were considering, and after at most five minutes said to us “too vacant.” We did not listen. About a week later the newly incumbent EM assistant turned the rod that positioned the electron-beam aperture to position four. Unfortunately there were only three electron-beam apertures on the instrument. Repair cost $3000. Carolyn was so right. There are so many stories that I could tell about my interactions with Carolyn, starting all the way back in 1991, when she was one of my dissertation examiners, through my years in the lab since 1994, and up to her last weekend, when she managed, despite her condition, to crack a smile (? in approval or disapproval?) of me and my wife and daughter singing her a Hannukah song. But perhaps the interaction that made the most impact on my career was one of the very first assignments she gave me in the laboratory: to write what I thought would be a simple e-mail, to David Parry about heptad breaks in alpha-helical coiled coils if memory serves me right. I had always thought that an e-mail, especially one to a friend and colleague, would be a fairly straightforward endeavor, one to be accomplished perhaps in a few minutes or at least within the same day. But not that one – not my first e-mail from the Cohen laboratory. That e-mail required multiple revisions, with Carolyn editing and re-editing and re-re-editing every aspect of it – the science of course, but also the grammar and the word choice. Finally, after about a week – and that is not an exaggeration – I was given the green light to send, or should I say submit, the e-mail. I was thinking it was going to take me a long time to finish my projects in the lab – and indeed, after twenty-three years, I’m still here! (sort of). But in all seriousness, Carolyn’s ability to effectively communicate science, in a concise manner and using simple language, was one of her most remarkable attributes, as were her love, support, and humor. Much of our collaborative research subsequent to my post-doctoral fellowship with Carolyn (1969-1971) was done by fax and email. Voluminous faxes arrived daily during the hectic periods prior to one of our heptad/coiled coil papers but they were rarely signed “Carolyn”. Instead, “C2” appeared at the end of the fax. Consequently, while others may (logically) think of Carolyn Cohen as Carolyn she increasingly became known to me as C2. C2 was not one to hide her feelings on anything of importance. If things went well then she would walk down the corridor telling everyone at the top of her voice that she had just made a major breakthrough. Once, however, her propensity to say out loud or indicate exactly what she was feeling, irrespective of the consequences, nearly got her into serious trouble. She was driving home one day when a motorcyclist swerved in front of her, forcing her to brake sharply. She immediately displayed 40% of the digits on one hand to the motorcyclist (i.e. two fingers to those having problems with the maths) and drove on. The next traffic lights were red so she had to stop and as she did so the motorcyclist stopped alongside her, took his helmet off thereby revealing a heavily tattooed face covered in scars. Apparently, he was a member of a bikie gang. He proceeded to kick in the door of C2s car with his heavy boots, causing extensive damage. C2 then beat a very hasty retreat breaking numerous speed limits en route home but, and this is the good news, she lived to tell the tale. I am not sure whether C2 was extraordinarily brave or just a slow learner but she never changed, and she continued to give everyone the chance to hear first-hand about how she was feeling about important matters in her life. During the early days of my post-doctoral fellowship with C2 she asked me to collect a table tennis table that she had purchased. We had a VW van so part of it could fit inside but part couldn’t. It was much less demountable that such tables are today. Somehow we managed to get it there in one piece without being stopped by the police. Her rental (in those days women could not have a mortgage, only men) was an obstacle course for the table since her accommodation was full of Buddha-like figures. These (and from memory there were about 15) varied from about 20 cm through to 2 m in height with widths not that much less, and there were several in each room. She was minding them for a friend on sabbatical. We learnt very quickly that C2 was not your everyday run-of-the-mill scientist but a delightful eccentric with a fervour for life rarely matched. Life in Boston was clearly going to be interesting, as indeed proved the case. 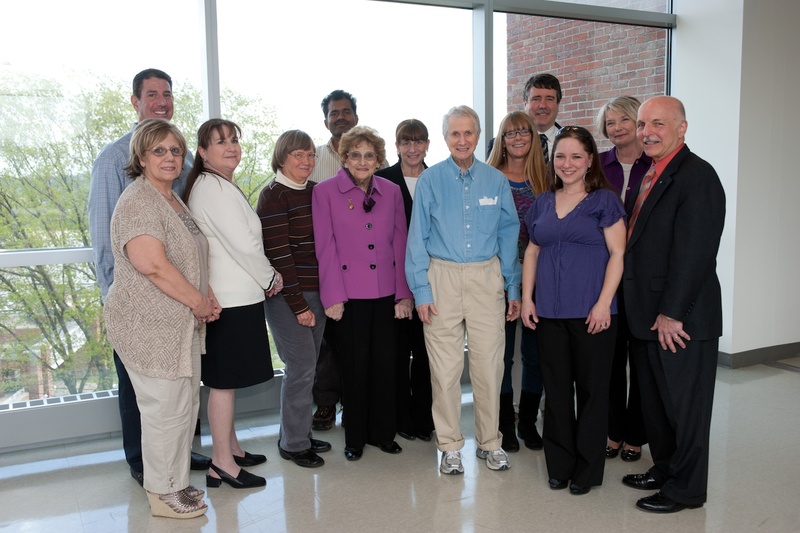 I joined Carolyn Cohen’s muscle structure group at the Jimmy Fund in early 1973, and moved with her, Don Caspar and Susan Lowey to their new Structural Biology Laboratory in the Rosenstiel Center later that year. The lab attracted a unique combination of talents, and was designed with an open plan that encouraged collaboration between groups. The core of X-ray diffraction, electron microscopy and computing equipment and staff was surrounded by open bays. Over 40 people interacted and flourished there. Carolyn’s core group focused on crystallography, while a small subgroup moved into 3-dimensional reconstruction of muscle protein assemblies from electron micrographs, in collaboration with David DeRosier’s group with their expertise in image processing software and the then developing cryo-EM techniques. It was an exciting time, though we glimpsed only dimly the extraordinary progress of later years that would yield atomic resolution structures and a Nobel Prize. Carolyn was the best of mentors, and encouraged my subgroup’s development with space and funding. We became not only colleagues but friends, and she supported me when Brandeis created the staff category of Senior Scientist in the Rosenstiel Center, allowing experienced postdocs to provide continuity to the research groups. It was the best of times. When I decided in 1996 to turn my long-time avocation into a second career as a minister, she was warmly supportive. She came to my ordination, and for years afterwards would call me every few months to update me on her lab’s progress and enquire after mine, as well as to update me on lab gossip. I was delighted that during the past 20 years, many of her long-term crystallographic projects came to fruition, revealing the function of muscle proteins at atomic level. As aging took its toll, she related the solace she found in returning to active participation in her Temple. We became spiritual colleagues as well as scientific and personal ones. For so many reasons, not least her nurture of postdocs and grad students whom she launched into often distinguished careers, I have the fondest memories of Carolyn as a human being as well as a biological scientist of distinction. She was held in high esteem by colleagues and friends for her intelligence, insight and breadth of knowledge. Her appreciation of literature, art and music, her mentoring of young women in science, mean that her influence continues to spread and inspire many. I am deeply grateful to have known her, and mourn her passing. It is with great sadness that I write these few remembrances. I first met Carolyn in 1957 when I was a postdoctoral fellow with John T. Edsall at Harvard. From earlier work Edsall had an interest in muscle proteins and we had group meetings in his laboratory which Carolyn attended. I had planned to go to Cambridge, England to learn X-ray diffraction from Hugh Huxley, but Carolyn, in her usual forceful way, persuaded me to join her instead at the Children’s Cancer Research Foundation (known as the Jimmy Fund) as a postdoctoral fellow. 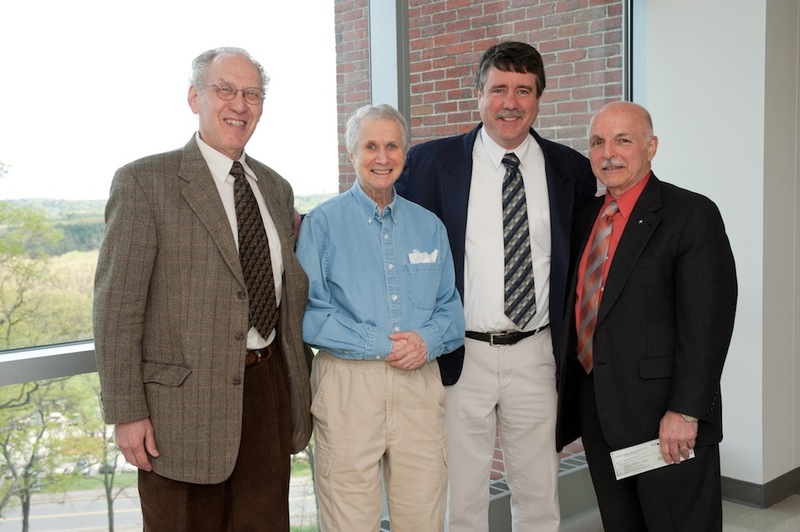 Together with Don Caspar we started a Structural Biology Program which was moved to the newly built Rosenstiel Center at Brandeis University in 1972, where David DeRosier joined us the following year, and where we all remained for over 20 years. Carolyn was not only an outstanding scientist, but she had a deep knowledge of literature, especially the French classics which she read in the original language. Early in our relationship I was instructed to read Proust (in English), but I never got very far. Despite this failing, we became great friends; she had profound insights in many fields, and, importantly, a wonderful sense of humor to accompany this erudition. She was a unique person. Carolyn (aka “C2”) was colorful, unconventional, warm-hearted and had a lively sense of humor! “Hi honey” were her first words to me (during my interview at Brandeis)! Her fascinating science and scientist stories (many reflections were from before I was born) were a welcome distraction as we often found ourselves being the only souls on the fourth floor in the Rosenstiel Basic Science Center on weekends! Yes, her love and commitment to science was infectious and going strong for very, very long! Most of us can only dream of holding an R01 for 39 consecutive years! I’m grateful for having been her colleague and friend. Carolyn Cohen was a remarkable Lady with lots of humor and passion for science. She had high expectations and standards of how a scientist should behave, think and write — she taught me a lot in particular in writing papers – in her view, papers had to become masterpieces — Carolyn loved to write in fact to summarize as clearly as possible the beauty that a careful scientist had found upon studying an important biological question. Carolyn and I also had very long conversations on how to reach internal Peace and Joy. She was very quick and sharp and knew how to ponder difficulties in life with a very good sense of humor. I feel grateful to have shared with her so much intense moments of science and friendship. During the years that I worked closely with Carolyn, she was fond of two mottos: (1) “The devil is in the details”; and (2) “Your reward is not in this World”. The first is a truism for both structural biology and life, because true understanding comes from hard work to explore the fine details. The second is a Torah principle, that the righteous are rewarded in the next World, not this one. Thus, in this world one should be motivated by doing what is right, not by the promise of fame, fortune, honor, or pleasure. I think that these principles and her passion for science is what drove her. Carolyn Cohen was certainly a special person who was passionate about her work. I had the benefit of working with Carolyn over the years while she competed for continued support of her research. Carolyn was first funded under the National Institute of Arthritis and Musculoskeletal and Skin Disease (NIAMS) in 1973 for her project entitled, “Muscle Structure and the Contractile Mechanism.” This project continued to be funded for a total of 39 years (1973-2012), with Carolyn holding the all-time record for the longest funded research project under the NIAMS institute. It was an honor to know and work with Carolyn. I have been associated with Prof. Carolyn Cohen from 2000 to 2007 at Brandeis University, USA. It was my utmost pleasure to work under her warm and caring guidance. Far away from home she was like a mother figure in USA for me. When she offered me a postdoctoral research fellow position, she not only looked for a home to stay for us but also helped me in arranging a postdoctoral position for my wife in Brandeis itself. She was an extremely caring and loving figure in my life though out my association with her. When we used to go for synchrotron trips for data collection, for field trips she used to call us regularly to know the status of data collection but never missing to add “stay warm, eat well and don’t exhaust yourself”. There was a knack of adding personal touch and care in her which made her so unique from my all other professional associations. It is really sad to know that she is no more. Hope her soul rest in peace. My lasting memories of Carolyn go back over 50 years when I arrived in the US as one of Andrew Szent-Györgyi’s first post-docs when he moved to Brandeis (1966-70). What a fantastic time being supervised by Andrew in protein chemistry and by Carolyn in EM/structural techniques. I stil have vivid memories of those times. I will always remember our lively meetings discussing our latest results and the very detailed and prolonged discussions we had writing up our papers. I will also always remember being woken up by Carolyn at about 4am in the morning on a number of occasions when she had apparently ‘lost’ some vital EM plates. Of course next day they turned up! Many of us considered Carolyn as our ‘academic mother’. She would rule her lab with unbending control which could be difficult, to say the least. But, she had a brilliant sense of humor and, if you looked closely, had a very kind heart. I have many stories of working with Carolyn but here is one of my favorites. When I started working as the manager for the electron microscopy lab back in the fall of 1984, I quickly learned that I had a lot to learn. These were the early days of setting up a new electron microscope and eventually a new lab space for solving protein structures by the technique of cryo-electron microscopy. Everything about this was quite new and quite difficult. Lucky for me that I had the opportunity be mentored by some of the very best in the business of this budding field. During the first six months of my nearly 17 years with the Brandeis structure group — nearly 50 scientist, students, post-docs and technical specialist during those early days — I noticed that every other week or so I would hear the ‘Happy Birthday to You’ song emanating from the old coffee area just down the hall from my office. Apparently, this group really liked cake. One day, Carolyn and I were working at the bench preparing a protein for an initial look in negative stain prior to plunge freezing the sample when, once again, a rousing chorus of ‘Happy Birthday to You’ could be heard. Carolyn started laughing and then asked when it would be my birthday. ‘Actually, it is today’ I answered. She looked at me in amazement and then wondered if the party was for me. I assured her that it was not and we went back to work. The very next day, just before lunch, the singing began once again. Carolyn stepped into my office. Obviously something was up. So I walked with her down the hallway of the lab to the coffee area to be greeted by my co-workers singing happy birthday to me this time. Carolyn gave a lovely speech and then we started serving slices of the best French chocolate cake that, to this day, has not been surpassed. She told me later in her office how utterly unfair it was that my birthday had not been celebrated and she had to fix that. She ordered and delivered that delicious cake from her favorite French bakery in Wellesley as a special treat for me. I will never forget her kindness. In the summer of 1964 I took a 2-month leave from a postdoctoral stint with Herman Eisen at Washington U Medical School to work on a project with Susan Lowey at the “Jimmy Fund”: it was a memorable experience and led to enduring friendships with Susan and Carolyn. Carolyn was unique for her intelligence and humor, knowledge of French literature, and amazing book collection, as well as her scientific accomplishments. But less well known, even to her friends , she also enjoyed playing tennis, as I did and we played a few times on courts within the Harvard Longwood Medical complex, now undoubtedly replaced by a research building. A few years later, when Susan and Carolyn were at the Rosenstiel Ctr at Brandeis and I had joined the Biology Dept at MIT; the three of us gathered in Carolyn’s then Newton apartment to watch Billie Jean King play (and defeat! ) Bobbie Riggs in their infamous tennis match. We were totally engaged and delighted with the outcome. Carolyn surely had tough times in the last few yrs, but whenever I think of her, I smile. Please do read the two wonderful light-hearted heart-felt memoirs by Carolyn in the JBC. 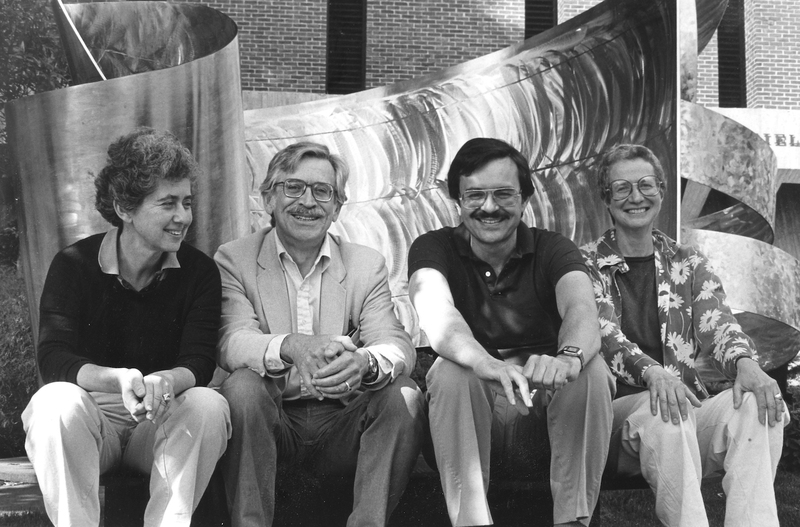 In 1972, Carolyn Cohen, Don Caspar, and Susan Lowey brought the Laboratory of Structural Biology from The Jimmy Fund to the fourth floor of the Rosenstiel Basic Medical Sciences Building at Brandeis University. As far as I know, it was the first so named laboratory at a time when most institutions were creating laboratories of molecular biology. The three of them were a forward thinking trio. I readily accepted an offer to join them in 1973. We put together shared facilities for x-ray diffraction, electron microscopy, and biochemistry. Our research groups interacted extensively with our collective size growing to about 40 people. The goal of our joint effort was to study large structures such as muscle, viruses, and enzyme complexes. Carolyn devoted herself to muscle structure and function in collaboration with Susan Lowey and Andrew Szent-Györgyi. I want to depart from Carolyn’s scientific achievements, which have been noted by others, to point out that Carolyn was a gifted writer and speaker. To get a measure of her gift, read “Good Times with Don Caspar” (Biophys. J. 74, 532-533, 1998). Her other historical writings are mentioned in the official announcements of her death. Carolyn was an articulate and vocal voice for women in science. Deeply distressed by the treatment Rosalind Frankin had received, she gave a magnificent lecture to a packed house on Rosalind Franklin’s life and her own experiences with Rosalind Franklin. She talked not about achievements but about the human interactions that are so important to scientific life especially to the women of her generation. She will long be remembered as a scientific colleague and a witty, engaging conversationalist. On April 24, a Children’s Leukemia Research Association (CLRA) award was presented to Jerry Brown, a Senior Research Scientist who works with Carolyn Cohen at the Rosenstiel Basic Medical Sciences Research Center. The award will help fund research on structures of α-helical coiled-coils, in particular those from myosin implicated in certain leukemias. 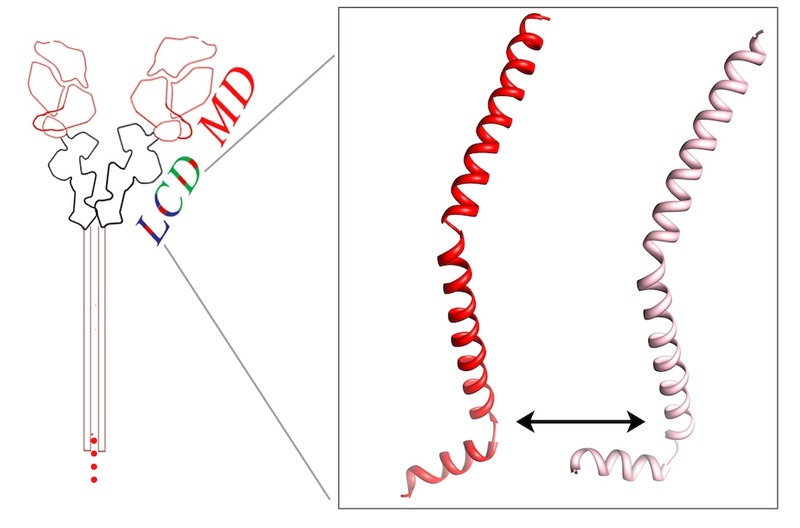 The α-helical coiled coil is a common dimerization motif in proteins and is implicated in many normal physiological as well as pathological processes. Many cases of acute myeloid leukemia involve the aberrant fusion of the transcription factor, CBFβ, to a long portion of the smooth muscle myosin rod, which is predicted from its amino acid sequence to form an α-helical coiled coil. A major aim of the proposed research is thus to crystallize and determine the atomic structures of the segment of the myosin rod nearest this fusion point, both in its normal unfused physiological state and when aberrantly fused to CBFβ. A related aim of the research is to understand how the conformations of α-helical coiled coils in general are affected by attached structures. Accomplishment of these aims may provide a structural basis for the rational design of drugs that can selectively disrupt the activity of the pathologically fused protein. In addition to Dr. Brown and Professor Cohen, the award presentation was attended by their laboratory researchers Senthil Kumar, Ludmila Reshetnikova, and Elizabeth O’Neall-Hennessey, Rosenstiel Director James Haber, Brandeis Office of Research Administration Associate Director Patricia McDonough, Rosenstiel Department Operations Manager Anahid Keshgerian, CLRA President Anthony Pasqua, his daughter Susan (Pasqua) Bogue, a survivor of leukemia, and Nancy Golden and three of her children. The award is named after another daughter of Nancy Golden, Amy Golden Uleis, who lost her battle with cancer at age 52 and was a graduate of Brandeis. The award presentation was accompanied by a photo-op and a small reception held at Rosenstiel. In this week’s on-line issue of the Proceedings of the National Academy of Sciences (PNAS), Brandeis researchers Jerry H. Brown, V. S. Senthil Kumar, Elizabeth O’Neall-Hennessey, Ludmila Reshetnikova, and Michelle Nguyen-McCarty ’10, together with Professors Andrew Szent-Györgyi and Carolyn Cohen, and Brookhaven National Laboratory researcher Howard Robinson, reveal the existence of a pair of major new hinges in the muscle protein myosin. Muscle consists of myosin-containing thick filaments with projections, i.e. myosin heads, that exert force on actin-containing thin filaments during contraction. Previous crystal structures of the myosin head from bay scallop striated muscles and vertebrate muscles have already shown how this motion is produced by the amplification of small conformational changes about hinges in the motor domain (MD) by the so-called lever arm, which consists of the converter and elongated light chain binding domain (LCD). Just like a baseball bat or other lever arms we are all familiar with in the “real world”, this LCD of myosin has appeared to be relatively rigid in these crystal structures, as it needs to be to transmit force effectively. But it has also long been expected that in muscle the myosin head, including its lever arm, is likely to contain elastic elements so that force can be produced under various strains. (Left) Schematic of a myosin molecule and (right) the two conformations of the heavy chain portion of the LCD. The Brandeis researchers originally set out to crystallize a myosin LCD corresponding to that from the catch muscle of sea scallop because it contains a specialized sequence whose structure was predicted to give insight into how muscle contraction of smooth muscles is turned on and off. Remarkably, however, as described in the PNAS article, this LCD forms two different conformations in the crystal, about mechanically linked hinges in the part of the lever arm distal from the motor. For the first time — and quite unexpectedly— a potential major elastic element in the lever arm has been visualized at atomic resolution, one that allows the length of the lever arm to change by about 10%. Sequence comparisons strongly suggest that these specific hinges are likely to be found in the lever arms of all muscle myosins. These comparisons also indicate differences in the degree of flexibility about these hinges in the different myosins, perhaps helping to account for the different properties (e.g., speed of contraction) of different types of muscle. This result may also be important for mechanical engineers. In 2009, one of the authors (JHB) wrote an article in American Scientist that expands the concept of biomimicry by describing potentially novel joints, switches, and other mechanical designs that can be derived from the structures of various proteins. The current results in the PNAS seem to add one more. As described by Olena Pylypenko and former Brandeis researcher Anne Houdusse in a commentary scheduled to accompany the print version of the PNAS article, the motion about the hinge of the myosin LCD resembles the motion of a foot relative to a leg about an ankle. A lever “arm” that can extend or compress about an “ankle” may thus be one more novel mechanical design that nature can teach us about.